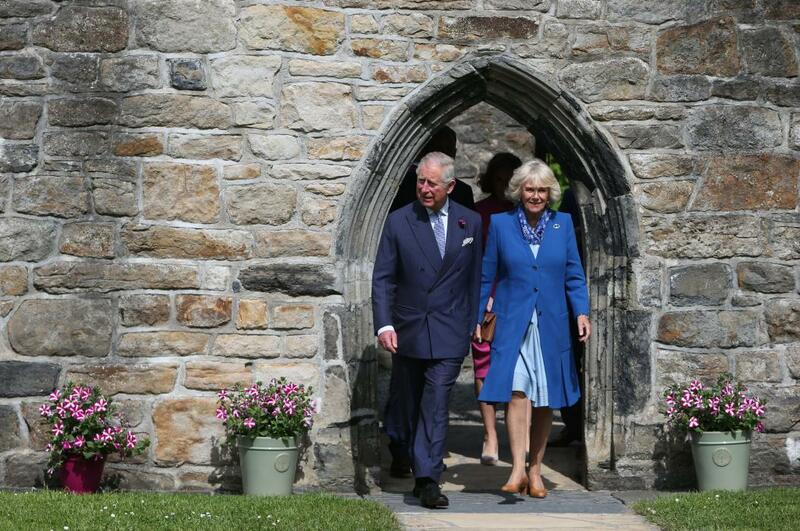 The Prince of Wales and The Duchess of Cornwall arrived in Ireland today for a one-day visit to the country. Today began in the stunning town of Donegal, where Their Royal Highnesses toured Donegal Castle and heard about the history of the Irish town during a walkabout in The Diamond, Donegal’s Town Square. The Royal couple were welcomed to the town by local musicians and Irish dancers, who performed outside the castle. During the tour of The Diamond, The Prince and The Duchess met crowds of well-wishers before heading to McGettigan & Sons Craft Butchers, who have been trading in Donegal since 1952. Founder Michael McGettigan’s sons, Donegal since 1952. Founder Michael McGettigan’s sons, Ernan and Diarmiud McGettigan, now run the shop. While in #Donegal on the #RoyalVisitIreland, Their Royal Highnesses visited McGettigan & Sons Craft Butchers, who have been trading in Donegal since 1952. The Prince and The Duchess had the chance to try some of McGettigan’s award winning sausages during the visit. The butchers’ Irish sourced hickory and maple sausage has won international awards for quality, flavour and originality, and Their Royal Highnesses were invited to try some of the sausage during the visit. Next, it was a short journey for The Prince of Wales and The Duchess of Cornwall to Magee of Donegal’s Tweed Factory. This clothing manufacturer and retailer is best known for its traditional tweed, but also manufactures items from linen, wool and other materials. Their Royal Highnesses toured the factory floor, escorted by CEO of Magee’s, Lynn Temple, and met staff who were working on fabrics and garments. Magee’s celebrates its 150th anniversary this year. Before departing the factory, The Prince and The Duchess were presented with a beautiful gift of traditional tweed. Arriving in the town of Letterkenny, Their Royal Highnesses attended a civic reception at the Letterkenny Institute of Technology, which was attended by council officials and business leaders. Following the reception, His Royal Highness toured an exhibition at the Institute and heard more about the Business, Engineering, Science and Tourism projects taking place there from students. Addressing guests at the reception, The Prince said: "We are particularly happy to come to Donegal, a place of dramatic and beautiful scenery, of music and story-telling, of myth, legend and the Irish language, and a place, of course, where the link between Man and the land is still so well understood. "It is also a place of innovation and creativity, as the work of this Institute shows." The Duchess of Cornwall meanwhile was visiting Ballyraine National School to hear about The Pushkin Trust projects taking place there. The Pushkin Trust aims to engage children, their parents and educators across Ireland and Northern Ireland in the common bond of creativity. During the visit to the school, Her Royal Highness met pupils who were reading, performing and gardening. The Duchess is a strong supporter of literacy and is Patron of a number of literacy charities. The Prince of Wales and The Duchess of Cornwall then reunited for a visit to Glebe House, where The Prince viewed a selection of works by Derek Hill, His Royal Highness’s former artistic mentor. Derek Hill lived at Glebe House for nearly 30 years. He painted many portraits during his lifetime, including two of The Prince of Wales. The last stop for Their Royal Highnesses in Ireland was Glenveagh Castle, which is located in the beautiful Glenveagh National Park. Surrounded by the Derryveagh Mountains, the park is one of six National Parks in Ireland. Their Royal Highnesses toured the gardens, heard about the conservation programmes Glenveagh is currently involved in, and experienced the stunning view across the Lough.